The term “epic” is often thrown about to describe things that fall short of the word’s actual meaning. 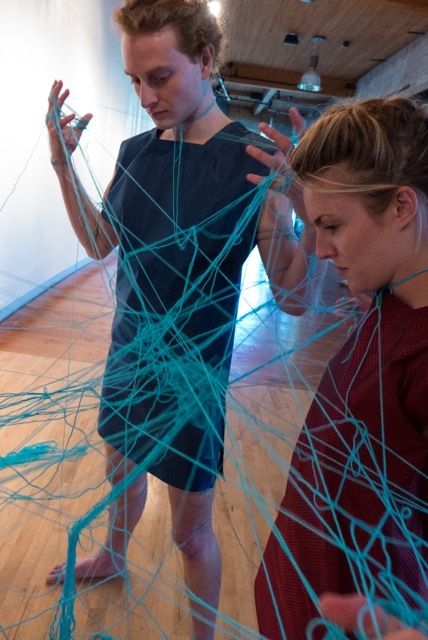 The Yellow Fish // Epic Durational Festival, however, now midway through its run at the Hedreen Gallery on Capitol Hill, pretty much nails the term in multiple senses. Established and curated by local artist Alice Gosti, the sprawling festival lasts from July 9 to August 3, with performances ranging in length from the minimum one hour and stretching to the maximum of 48. Its duration, content, and Gosti’s plans for the future are all, in a word, epic. Watching a durational performance can feel like seeing something unfold in geologic time. It magnifies each moment, becoming a zoomed-in version of microevolution where every tiny transformation is evident. This creates space for performers to experiment and take risks, but it also gives the viewer ample room to think and reflect on what they’re watching. The mind is freer to wander or focus as it will than with traditional performative art. This was especially true at last week’s performance by Maryanna Lachman and Mara Poliak. 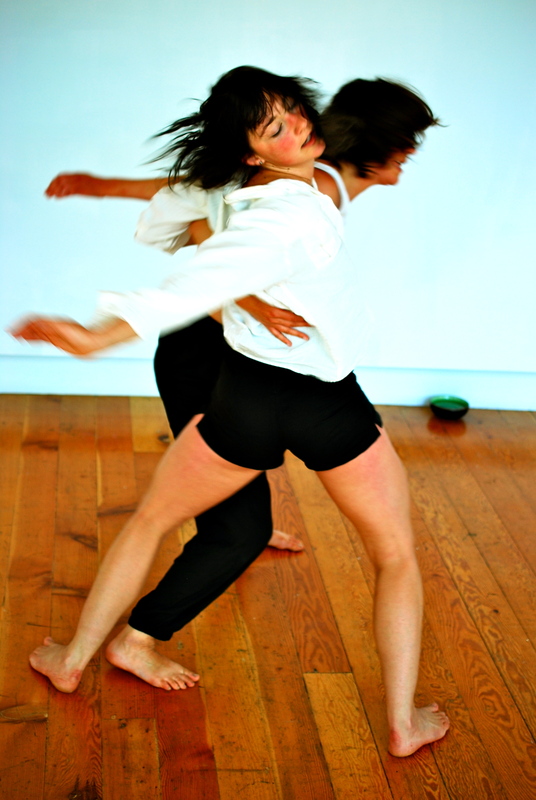 A movement-based work, it methodically explored physicality, at one point progressing from inch-worming along the floor, to spiraling their bodies in all directions. There was a great deal of trust and patience between the two performers, each finding her own path through their predetermined tasks. 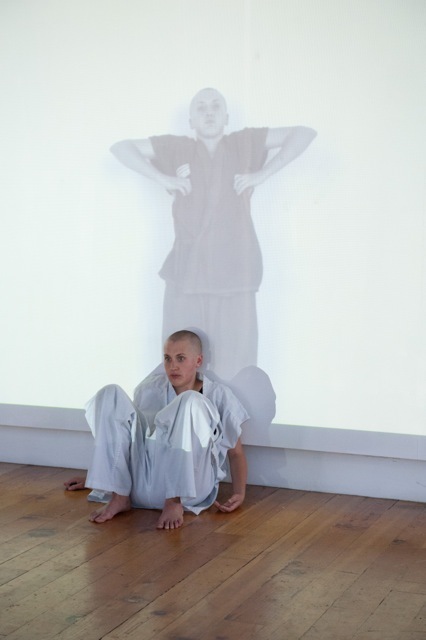 The whole idea for the festival stemmed from Gosti’s first taste of performing durational work herself. In 2011, Gosti presented I Will Follow You Deep Sea Baby, where she wrapped herself in toilet paper for Velocity’s Big Bang. Approximately three hours long, the piece catalyzed her ongoing and self-proclaimed “love affair with time.” In investigating why the piece impacted her so much as an artist, Gosti realized she needed to perform it again, but was repeatedly turned down from festivals because it didn’t fit the traditional festival format. Through conversations with friends—one of whom was Amanda Manitach, the curator of Seattle University’s Hedreen Gallery—Gosti jokingly came up with the idea of starting her own festival. What started as a half-imagined jest became a reality when Manitach suggested she use the Hedreen as the festival’s staging ground. Gosti had just over two months to plan last year’s festival, but she pulled together ten artists and lay the groundwork for many years to come. Though she continues to shape the festival’s parameters and smooth out the logistics, Gosti established several fundamental premises last year that are now touchstones of Yellow Fish. The first parameter was the time: works must be a minimum of an hour and maximum of two days. Second, she wanted each performance to leave a material artifact, a trace of its existence, that would stay in the gallery until the end of the festival. The remnants accumulate, turning the space itself into another slowly evolving work of art. The air in the Hedreen has a pleasant kind of expectancy to it. You walk in and know something is happening there. Working in a pay-it-forward system of sorts, artists in the festival submit names of other artists for the following year’s festival. 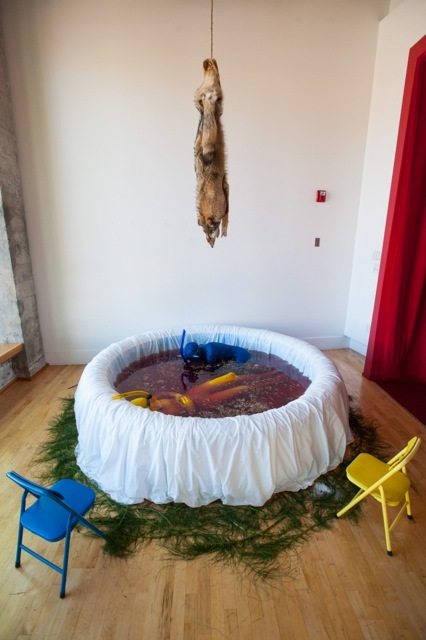 From this pool, in addition to her own research and networking, Gosti selects around ten artists (this year there are sixteen) to participate in Yellow Fish. The pool has expanded broadly as connections are made, and word of the festival and its uniqueness spreads. While last year retained a largely local presence, this year there are participants from San Francisco, Portland, and as far away as England. Another of Gosti’s rules is that artists are only allowed to perform in the festival once. Furthermore, Gosti prefers to have the same experience with the work as any other audience member, so she doesn’t require performers to tell her what they’re going to do beforehand. She facilitates conversations to help the artists fill the needs of their work, offering advice if it’s asked for and perspective if it’s needed. Otherwise, the responsibility belongs to the artists. “Some people need to know what’s going to happen before it happens and some people don’t, she says. “It’s a different methodology of work—so it’s allowing both of those, which is really interesting to watch.” Gosti hopes to continue to diversify the types of artists in the festival as well, expanding beyond the dance community which she knows best. This year there are photographers, videographers, composers, and artists that bend the rules of genre classification entirely. “As more years go by, I’m trying to expand it to the art field in general, and people that are interested in exploring time,” Gosti elaborated. The concentration of this style of art in a month-long span is delightfully different but also perfectly fitting. So much art today blurs genres, stretches perceptions, and invites viewers to have experiences beyond just sitting in their seats. In step with this zeitgeist, Yellow Fish creates a roof over these ideas and allows them to crack open their form even more, slowing things down so viewers have the time to catch up to the transition. Good art makes you question and wonder a little differently, and the work in Yellow Fish brings up questions about the nature of performance itself. Does it even require an audience? What would happen if they couldn’t leave? And how do endurance and durational art differ? This is truly just the beginning for Yellow Fish, because Gosti sees the festival lasting in perpetuity. When she is no longer the curator, she says, someone else will take it over. Seattle is lucky to be witnessing the early stages of something wholly unique, when things are still a little raw. The whole festival cultivates an air of unexpectedness. There are no dress rehearsals for durational work. Performers plan and then enact their plans, giving something to whoever is there to see. As The Stranger already noted, if you want to know what’s going to happen, you have to show up. This is true for all performance art, but it’s particularly crucial for Yellow Fish. In the end, Gosti notes, there’s no point in talking about these things. “You have to commit. You have to go.” Gosti’s own commitment to the festival is well worth getting caught up in. There’s one week left, so get yourself there and commit already. More information about Yellow Fish // Epic Durational Festival and a schedule of upcoming events see their facebook page. Also follow the festival on Tumblr, or watch footage of performances on Vimeo.